Little Dorrit. With Illustrations by H. K. Browne. London: Bradbury & Evans [1855-57]. 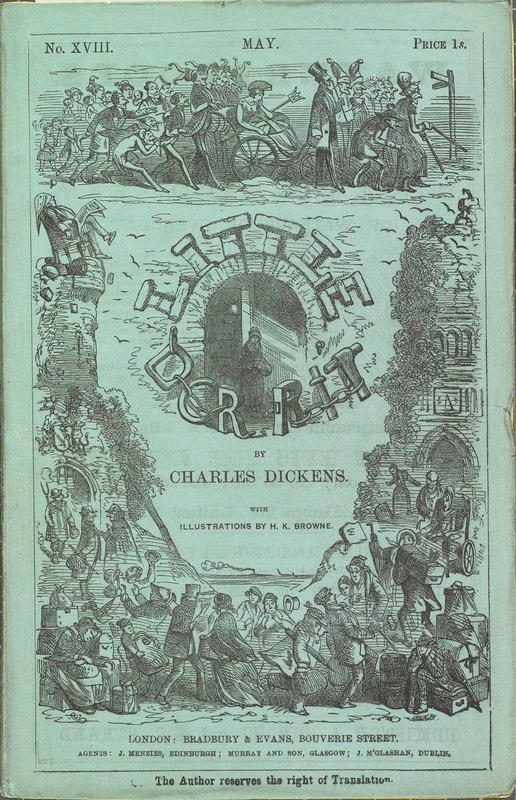 The eleventh novel of Charles Dickens, Little Dorrit is the story of Amy Dorrit, the “child of the Marshalsea.” Dickens was familiar with the Marshalsea as it was the same debtor’s prison in which his father, John Dickens, was incarcerated from February 20, 1824 to May 28, 1824. This edition contains twenty numbered issues in nineteen parts (issued from Dec. 1855 to June 1857). Each issue has its own printed wrappers, and printed advertisements from a variety of sponsors including the publisher. Preliminary matter, including a table of contents and list of illustrations for the complete volume was supplied to the subscriber by including it bound in at end of last part. Hablot K. Browne (Phiz) provided the illustrations for Little Dorrit.